The Authenticity Experiment, the end of the world edition. When I was growing up, a young, sensitive, empathic Pisces, given to reacting to sudden changes of mood in the room, my mother would say to me, Oh, honey, it’s not the end of the world. Then, I understood this as dismissive. I wanted a mother who knew her high intuitive daughter needed soothing, a hug, some tea, and the reassurance that everything would be okay. Instead, what I got was, Oh, honey, it’s not the end of the world. Even when she began dying. As I assessed the situation and decided to call my sisters to come, I sat at her bedside, where she lay unresponsive, held her right hand, still so soft, the skin so thin and friable, and put my head on her soft belly and cried. She woke up and asked why I was crying. I said, Because you’re dying, Mom. And she replied, Oh, honey, it’s not the end of the world. I said, It is to me. You’re my mom. Then she fell back into that liminal space and I continued crying, but I also felt my psyche shot through with this revelation that my mother had NEVER been dismissing me in those moments, but had, actually, tried to give me true and practical, pragmatic advice. It wasn’t the end of the world and the feelings would pass. That’s what she meant, I believe, every time she said, Oh, honey, it’s not the end of the world. And I don’t know think it was time or therapy or 12-step work that changed my understanding. I think being with someone close death, instead, is what has forced me always to the present moment, and opened me to the most piercing insights. It happened when my father died, it happened when my friend Stef died, and it happened in this moment two days before my mother died. I was reminded of this phrase as I went to climb on my indoor trainer this morning. This week challenged me in ways I haven’t felt in more than a year, challenged me to control my thoughts and to remember that feelings aren’t facts, and that there is always another door to walk through—even if you don’t like what’s on the other side—there is a door. If these sound like slogans to you, that’s because they are. But they work to redirect my hamster wheel of a brain. If you don’t have a brain like this, I think you’re lucky, but really, in this age of instant communication and social media, who doesn’t have a brain like this? Constantly running, wondering what happened and what’s going on now and what’s next. Squeak, squeak, squeak as the wheel spins faster and we run to keep up with it, paradoxically pushing it faster until we collapse. But, right by my trainer, is a picture of my mom and a beautiful paperweight with her ashes swirled in it. Maybe you think that paperweight sounds macabre, but it looks like the universe to me, and given Joni Mitchell was literally right, we are stardust, it seems appropriate. My left foot clipped into the pedal, I looked at the photo as I started to swing my right leg up and over the rack and seat. I said out loud, Oh, Mom, I wish you were here to give me some practical advice. Then I heard her voice in my head, Oh, honey, it’s not the end of the world. And I realized she did have pragmatic advice that seemed to apply even in this situation. The world was not ending—not even remotely—and, as she was also fond of saying, This, too, shall pass. She’s right, my mom. It isn’t the end of the world and soon this will pass and I’ll hamster wheel onto something else. That’s the thing about our brains, my brain, really, and why I have to work a program to keep it in line. One of the Kates—there are 11 of them in my phone, which says more about my age demographic than the cacophony of Kates in the world—asked me why I had stopped writing these. I told her it was because I couldn’t bear to have my life out here on the stage anymore, that I have gone deeply internal, and besides, I didn’t have any nice tidy advice to tie up any of these posts. Ten of them are sitting in half finished in the folder, waiting for the insight to finish them. This Kate said something to the effect of, why don’t you just tell people that. So, maybe I’ll start putting half-finished pieces up. No piercing insights. Just fragments from a working writer’s life. My editor Judith Kitchen used to tell me to work with my weakness—which is wanting nice, tidy endings. I think this Kate basically said the same thing. So, I’m not promising anything. I’m just saying maybe. No tidy ending? I guess it’s not the end of the world, is it? I love your heart, Kate. And your writing. But honestly, it’s hard to tell the two apart. That’s the best comment ever, Rita. Thank you. I like this comment, too, and I second it. Please keep posting these, bits and pieces that they may be. You never know what someone will make of it when you send it out into the universe … just as your mom floats in part in that universe. 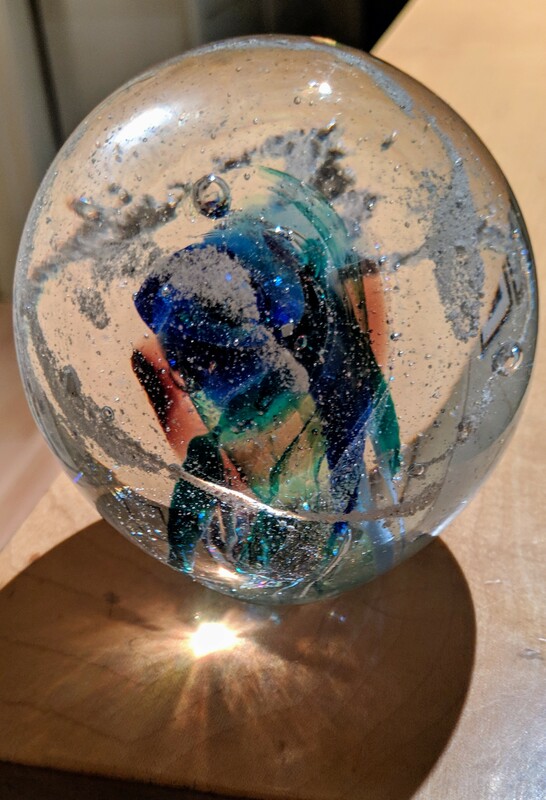 I am so incredibly grateful to have the image of that paperweight, yearning and sad as it makes me not to have the same with my own mother’s ashes. The image of yours brings me close to it, so thank you thank you thank you. Thank you, George. I didn’t know the were following these. I’m touched. Thank you, dear Kate. So much love. Judith is exactly right. When you can’t do anything with your writing, work with that. I just wrote an essay about my father’s death. I had to pull each sentence out of thin, empty vacuous space. I always like to read what you write. Thank you, Fleda. You may have had to pull out every line on that piece about your father, but it was so touching. Let’s both keep writing. I love your pieces. They move me and keep me company. Your funny dark wisdom is so lovely – and helps me every time I read your humanizing spins. Please continue! I love your writing so much. Thank you for writing this, Kate. It is honest and achy and beautiful, and speaks to the climate of my own emotions: the weather comes in, the weather goes out. I’m glad you’ve been honoring yourself by stepping back, and also happy to see your post come to my inbox. No expectations. Thanks for not having any expectations, Jackie. The Blue-Haired Kate and the Tall Kate have helped me queue up a few more. So you can, at least, expect that. I love your words. You don’t need to provide profound insights as sharing your process offers solace and beauty. Thanks for sharing your writing. Brilliant, as always. You give hope to those who strive for perfection in an imperfect world. I hope that I show you that perfectionism is a lie perpetuated by the media and is not attainable. As my mentor’s mentor said, “You can’t have perfection because anything perfect is dead.” It’s the great paradox of our striving. Oh, our momma’s voices are ultra resonant. Thank you for this, and I agree with any and all Kates, no tidy endings needed. Helps me to say that, too: our writing could be like a great conversation where you have to jump up and go get your hair cut or to the doctor, or to the grocery store and you and your friend say: bye for now, let’s talk more about this when we can, and some of them give you a hug and say they love you, and off we go. All the love and all the yessss to this. Nice to have you back! Plenty of insight in your writing… no tidy endings required. We are all a little messy, unfinished. Thats just part of your/our beauty. Perfection is overrated and sounds almost boring. I love you, Nicole Yvonne. Oh, I have missed these – with or without a tidy ending. I’m glad you’ve taken her advice. Both hers, mom and Kate. And your own, of course. I enjoy your words, tidy ending or no, very much. More, pleeeeease. Thank you for putting your writing out in the world. Stirs many feelings about my Mom and being a parent myself, and how the meaning of words can change when seen from another perspective. Thank you for this. Thanks for taking the time to comment, Barb. Hope all is good in your world. Kate, what an amazing gift that she said that to you as she was dying. “It’s not the end of the world, honey.” Say what? Yes it is for her. Quite literally. But she was focused on you, that your life would indeed go on fully. Maybe/And/or that she sensed hers would too. What a profoundly generous sentiment to have at the eve of death. You don’t have to have tidy endings Kate. Your stories don’t need bows because they’re powerful enough that we see them along the way. The sharing is the bow. And I, for one, know for someone like you there are new beginnings being born now. I love this, Shannon, thank you. You know something about new beginnings, too. “This to shall pass.” I remind myself of that when things are going well as well as in rough times and literally typed that in a message to a friend just before I read your post. Thank you, as always. Your sharing gained from your introspection, even if you are still in the midst is valuable. Thank you for the risk. It is appreciated. I am appreciative. Ironically, this post came while I was riding thru Portland on Amtrak, reading the novel Station Eleven, which is about the end of the world. And yet, not. A friend is dying. Every day I wonder how we go on. Step-by-step. Living offers no other choice. Yes, we go on because we must, right? It’s the harsh beauty of life. Terrific post. Next time you’re in Port Townsend, plan to drop by. I’ll brew a pot of tea and show you the Joni Mitchell “We Are Stardust” broadside I printed a while back. I will, Ellie! Are you coming to AWP? The orb with your mom’s ashes is lovely idea – stunning both as a piece of art and as a visual reminder of her presence with you. Kate, I’m not sure why this just popped up; exactly at the right time . Bless your mom, and you for sharing her wisdom! You say it so well.